This chapter presents a recipe for design-as-a-verb as a reflective conversation. The recipe employs the medium of construction guided by a composite appreciative system of the invested stakeholders. The terms “recipe” and “conversation” steer clear of any appearance of prescription. Both terms connote a sense of “becoming” rather than consummation. In that sense, the focus is on design as a “living cycle” rather than a final product of construction. At its core, the “becoming” conversation manifests the paradigm reminiscent of Agile development process models where refining the goals of the development project depends upon a conversation among designers and stakeholders. For example, in Scrum the product owner, Scrum master, and development team cooperate in artefact emergence by repeatedly assessing and adjusting the product backlog and sprint planning to react to the progressive learning and refinement of the project goals among the stakeholders. This chapter first presents the reflection-driven design recipe as it has evolved. 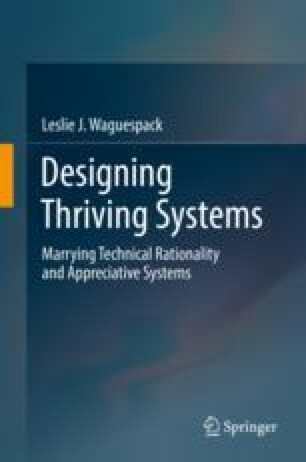 Then a synopsis of its origin in the analysis of code refactoring examines the role of Thriving Systems Theory in emancipating an operative appreciative system.